I guess we don’t have to wait for MWC 2013 to see what Samsung has got to offer, on the Samsung Galaxy Young at least. Yesterday, we reported that several unannounced Samsung devices made it to GLBenchmarks and one of them is this low-end Galaxy Young that runs on Android 4.1 Jelly Bean with “Project Butter” on board. Samsung has decided to go ahead and unveil this phone ahead of the mobile show which will be happening in Barcelona. 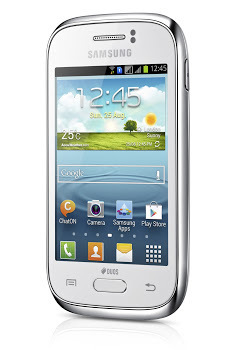 The Galaxy Young is a 3.3” device that will come in two flavors – either single- or dual-SIM depending on the market. As with most low-end Android devices from Samsung, it will come in a variety of colors namely white, deep blue, wine red and metallic silver. The Galaxy Young is powered by a 1GHz processor with 768MB of RAM on board. Design wise, it’s not one of those slim ones that might break in your back pockets, it’s pretty thick at 12.5mm and measures at 112g. Other specs include 3MP camera with no LED flash and capable of VGA recording, 4GB of internal storage expandable via microSD cards, and comes with 1,300mAh battery. No pricing yet but one thing’s for sure, it will definitely be affordable, hopefully, like the existing Galaxy Y.
Samsung also announced a slightly higher range Galaxy Fame that packs a 1GHz processor, a larger 3.5” display, and a 5MP rear camera with VGA front camera.